William Young Estate Auction — Harritt Group, Inc.
One level 3 bedroom – 2 bath ranch with detached pole barn & workshop located off IN 62 just 7 miles East of Charlestown State Road 3. Also selling vintage 1960 Thunderbird, tools, handicap scooters, furniture and collectibles. 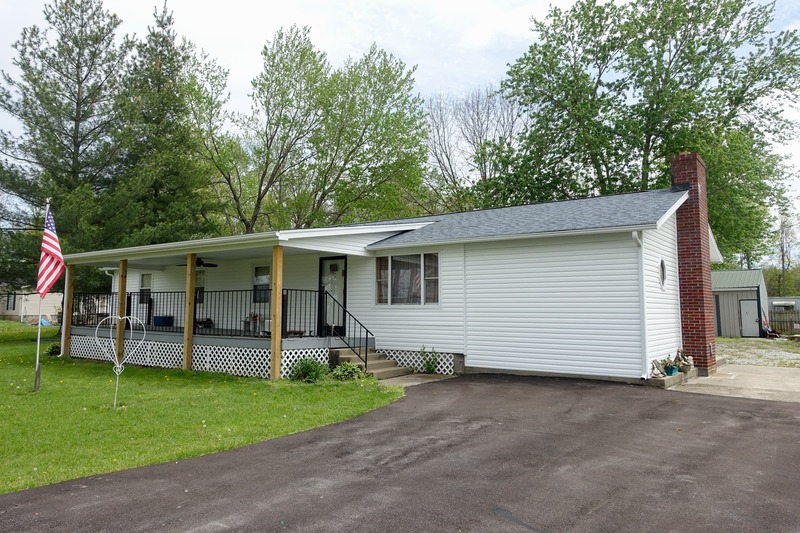 Spacious 1680 square foot 3 bedroom – 2 bath one-level ranch home built in 1980 on ½ acre lot plus detached pole barn and workshop. Home features living room, family room with wood stove, eat in equipped kitchen, laundry/mudroom & covered porch. Recent improvements include new siding, gutters & roof in 2016. 1960 Ford Thunderbird in AS-IS condition. Cub Cadet zero turn lawn mower with 17hp engine and 42” cut. Kobalt Pioneer stainless steel rolling tool box with electric outlets, Craftsman band saws, electric buffers, Dremel tool set, STIHL 026 chainsaw, 100-piece screwdriver set, Ryobi router, 4500 lb electric winch, several tool chests, chain hoists, Miller & Lincoln arc welders, Craftsman radial arm saw, drill press, generator, jig saws, air compressors, circular saws, pressure washer, battery chargers, acetylene tanks, Skil band saw, Craftsman 6.5hp chipper, electric and battery power drills, large selection of hand tools, electric chainsaws and blower, bolt cutters, Hilti TE55 electric drill, pipe wrenches, oil cans, hardware organizers with contents, extension cords, yard carts, industrial size electric fan and much more. Tom’s Toasted Peanuts jar, cast iron cookware, buggy bench, single trees, cider press, brass spittoons, face vase, weather vane, depression glass, retro electric fan, gas pump handle, retro car lights, folk art miniature tricycle, model car sets, toy cars, modern train sets, cast iron trains, blue mason jars, graniteware, coffee grinder, mantle clock, galvanized buckets, wooden box, oil lamps and lanterns, carved native american chief, native american decorative arts, Polaris telescope, flat screen TV, stereo system, glassware and kitchenware. Full size brass bed, rocking chair, sofas, lift chair, recliners, entertainment center, wooden and iron bench, porch swing and retro springer lawn chairs. I-265 to IN-62. East 15 miles, veer right onto Lakeside Drive with auction on right.